DIRECTIONS: At the intersection of Route 11 and County Road 53 in North Bangor, there is a flashing light. Turn south on County Route 53. Cross Route 11 B where the names Changes to the Skerry Road or County Route 13. Continue 2.65 miles. Turn left onto the Pickering Road for .4 miles. 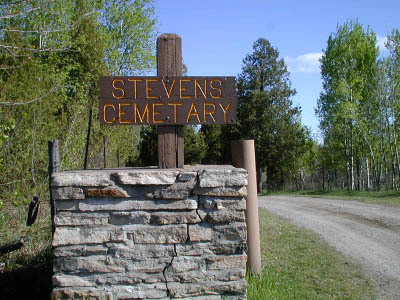 The cemetery is on the north side of the road which is your left. This transcription was completed 5 May 2001 by Joyce M. Ranieri & Nora Avery. Many thanks to Nora for her perseverance in helping complete this transcription! Upon completion, it was compared to an earlier transcription, author unknown. Discrepancies were resolved by re-checking the tombstones. Unresolved discrepancies are indicated in red. The oldest burial appears to be that of Louisa, wife of Grant THOMAS, who died Sep. 15, 1807. Semour (Simone) T. Died Aug. (July) 30, 1852 AE 3 (32) yrs. & 6 mos. Nathaniel Died May 5, 1848 AE 4 Mos. Corydon E. ADAMS Died Oct. 1, 1916 AE 86 y'rs. Mary A. DOTY Wife of Corydon E. ADAMS Died Oct. 26, 1890 Aged 54 Y'rs. 6 Mo's. Dau. of Corydon E. & Mary A. ADAMS Died Apr. , 1876 AE 5 yrs. (eroded mo's.) & 19 dys. Lucy M. Dau. of Henry & Clara ADAMS Died April 15, 1890 AE 2 mo's. Nathan ADAMS Died June 28, 1841 AE 49 yrs. & 3 m's. Lucy H. Relict of Nathan ADAMS Died Mar. 10, 1875 AE 76 Y'rs. 3 Mo. & 4 D's. Mary R. Daughter of Nathan & Lucy H. ADAMS Died Jan. 13, 1850 AE 15 yr's. & 7 mos. Adelia A. Dau. of Nathan & Lucy H. ADAMS Died Sept. 1, 1861 AE 21 yrs. & 9 ds. Charles (Carlos) S. ADAMS died Dec. 20, 1894 Age 71 yrs. Eleanor FERRIS His Wife Died Mar. 14, 1832 Age 54 yrs. 2 ms.
Fred Died May 20, 1886 Age 18 yrs. Flora CAMPBELL His Wife Died Nov. 27, 1915 AE 57 Y'rs. Hannah Wife of Henry BARBER Died Jan. 5, 188_ (1886) (NOTE: There is a metal repair rod covering the last digit of the date.) AE 39 Y'rs. Gone but not forgotten. Herman H. BARBER Died Dec. 4 (14), 1905 Age 36 Y'rs. 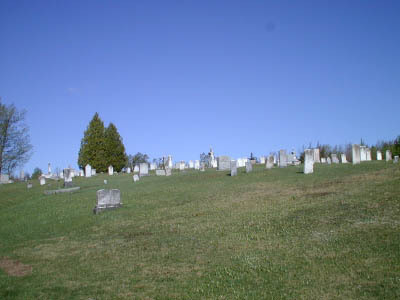 Footstones: Mary P., Ruth A., Charles, Orville F., Laura A.
William BARBER Died Apr. 11, 1859 In his 50 yr.
Sally Wife of William BARBER Died Apr. 17, 1892 AE 75 yrs. Deaf Jacob BARNHART Husband of Elizabeth PERSON Born May 12, 1826 Died Feb. 10, 1893 At rest. Anna BENTLEY Daughter of Orrin & Mary BENTELY Died Mar. (May) 11, 1853 Aged 19 years 9 mos. & 13 ds. Edna Died Mar. 25, 1886 AE 9 yrs. Sidney Died Mar. 29, 1886 AE 7 mo. Robert BOWLES Died Sep 1854 AE 21 yrs. I have finished the work which thou has given me to do. Harriet A. (Dau. of Ebenezer & Lucinda BROOKS) Died June 13, 1870 AE 31 yrs. Rollin C (or G) Died July 17, 1862 AE 20 yrs. Footstones: J.B., Wm. Sr., Wm. Jr., O.B. Edward Son of Charles & Nancy CAMP Died June 7, 1876 AE 18 y'rs. Isaac P. CARPENTER Died Nov. 28 (26), 1921 AE 68 Y'rs. Helen J. His Wife Died Apr. 25, 1915 AE 69 (60) Y'rs. Edgar A. Son of Geo. H. & Marion F. TAYLOR Died June 4, 1885 AE 13 yrs. 8 ms. 8 ds. Geo. H. TAYLOR Died June 3, 1876 AE 34 yrs. Maron F. SARGEANT His Wife Died Sept. 24, 1901 AE 59 yrs. Arvilla M. Dau. of Isaac P. & Helen J. CARPENTER Died Sept. 25, 1885 AE 4 Yrs. 11 M's. 11 D's. Footstones: H.J.C., A.E., A.M.C., I.P.C. Horace L. Son of Wm. H. & M. G. CROMLEY (BROMLEY) Died May 21, 186 (May 24, 1865) Aged 17 yrs. & 9 ms.
James A. Son of A. & M. CROSHER Died Feb. 7, 1833 Aged 6 yrs. 7 mos. & 10 ds. James A. Son of A. & M. CROSIER Died Feb. 7, 1833 AE 6 yrs. 7 mos. Catherine C. Dau. of A. & M. CROSIER Died June 2, 1833 AE 14 mos. Elvira Wife of Jonathan DAVIS Died Aug. 7, 1844 In her 33rd Yr.
Lewis DAY Died Mar. 8, 1862 AE 62 Y'rs. Also his wife Betsey Died Oct. 17, 1860 AE 64 Yrs. Arvilla F. His Wife Died July 23, 1896 In her 82 yr.
DeForest SARGEANT died Feb. 8, 1872 In his 33d yr.
Millard F. ELLIS Died Jan. 24, 1893 AE 45 Y'rs. Matilda His Wife Died Sept. 2, 1892 AE 42 Y'rs. Elma M. ESESLTINE Died August 12, 1881 Aged 26 Years She is not dead but sleepeth. Lester ESELTINE Died Jan. 19, 1893 AE 60 yrs. Thusa L. Died April 10, 1878 AE 9 Y'rs. Mary REARDON Wife of Anson ESELTINE Died Jan. 4, 1899 AE 51 Y'rs. Alice ESELTINE Wife of Edgar BAKER Died June 2, 1905 AE 29 y'rs. Shadrack ESELTINE Died Jan. 11, 1901 AE 94 Y'rs. Mandana His Wife Died Sept. 4, 1886 AE 76 Y'rs. 7 Mos. Alfred FARR Died Nov. 19, 1903 Age 63 Y'rs. Private Co. H. 142 Reg. N.Y.S. Vol. Inf. Frederick C. Son of J. H. & M. J. FARR Died Jan. 17, 1854 AE 8 mos. Hannah J. Dau. of J. H. & M. J. FARR Died Mar. 15, 1860 AE 1 yr. 4 ms.
Hannah Wife of J. H. FARR Died Dec. 13, 1847 In her 47 yr.
Oscar FARR Died June 30, 1908 Age 67 yrs. Emery FERRIS Died Mar. 30, 1865 AE 38 y'rs. Co. G. Scott's Nine Hundred N.Y. Cav. Adelia M. His Wife Died July 10, 1886 AE 65 Yrs. Winnie E. Dau. of E. & A. FERRIS Died Nov. 29, 1879 AE 17 Y'rs. Millard F. FERRIS Died Oct. 21, 1906 AE 58 y'rs. Mercy ROBBINS Wife of J. T. FISH Died Oct. 30, 1876 AE 80 Yrs. Gone but not forgotten. M. Mahala Wife of A. E. SEELY Died June 6, 1851 AE 22 yrs. Mary Wife of Artemas FLETCHER Died Aug. 14, 1842 Aged 43 Y'rs. We have not a word to say. Joseph Son of ______ & _____ FLETCHER Died April 20, 1832 AE 3 yrs. Parker FLETCHER Feb. 3, 1868 AE 66 yrs. Harriet Wife of Parker FLETCHER Died Jan. 15, 1894 AE 86 Yrs. 8 Mos. Jannett L. Daughter of Parker & Harriet FLETCHER Died May 24, 1855 AE 18 y. & 8 M. Gone but not forgotten. Our Babies Elwin Jr., Joyce E., Diane M.
Roseltha Wife of Miron GIBSON Died Nov. , 1889 AE 47 yrs. Ethel Dau. of F. & L. GONYEA died May 14, 1898 AE 9 M's. & 2 D's. Ransom HARRINGTON Died Dec. 1, 1879 AE 78 yrs. There shall be no night there. Sarah L. Dau. of Russell & Zulpha HARRINGTON Died July 26, 1844 Aged 8 mo. 13 ds. Royal Son of Russell and Zilpha HARRINGTON Died April 25, 1842 Aged 10 mo. 20 ds. George E. Son of Luke M. & Zilpha HAYWOOD Died Nov. 3, 1877 AE 21 Y'rs. 4 M'os. I must lie here till Christ appears. Mary L. Dau. of Chester & Lura HAYWOOD Died Jan. 18, 1838 AE 3 mos. Eld. Ezekiel HILDRETH Died May 8, 1879 AE 72 yrs. That they may rest from their labor. Mary D. Wife of Rev. E. HILDRETH Died May 18, 1886 AE 68 yrs. D. W. HILDRETH Died march 12, 1862 AE 19 yrs. 4 mos. Lurena M. Dau. of Elder & M. D. HILDRETH Died May 24, 1870 AE 18 y's. 1 mo. Luretta H. wife of Geo. W. HOLLAND Died Oct. 5, 1894 AE 55 yrs. John A. HOLLAND Died Aug. 3, 1873 AE 71 yrs. Nancy Wife of John A. HOLLAND Died July 27, 1846 AE 34 (31) yrs. Joseph HOLLAND Died August 14, 1855 AE 82 yrs. Henry HOLLAND Died June 9, 1879 AE 78 yrs. 6 mos. Laura S. HOLLAND Died June 18, 1860 AE 19 yrs. 5 mos. 27 d.
Joseph A. HOLLAND Died April 3, 1874 AE 24 yrs. 1 m. 15 Ds. Betsy J. HOLLAND Died April 19, 1855 AE 23 yrs. 1 mo. 1 ds. Eliza A. HOLLAND Died June 28, 1870 AE 35 yrs. 10 ms. 1 d.
Mary M. HOLLAND Wife of L. W. KNIGHT Died May 4, 1883 AE 24 yrs. 10 m. 22 d.
Footstones: Selina S., Joseph A., Mother, Father, Eliza A., Laura S., Betsy J.
Laura S. His Wife Died Apr. 8, 1869 AE 32 yrs. & 7 ms.
Lyndon Died Jan. 8, 1812 AE 34 Yrs. Veda Madge died Oct. 3, 1902 AE 4 ms. .24 ds. Mary Ann Wife of Isaac JOY Died Jan. 1, 1887 AE 61 ys. 4 ms. & 26 d's. She has gone to her long rest. Paul KERRY Died Jan. 27, 1911 Age 8 mo. 2 d's. Meriam E. KERRY Dau. of H. D. & N. M. KERRY Died Mar. 21, 1908 Age 10 mo. 8 da. Here lies ma, neatly where she belongs. John KNAPP Died Feb. 7, 1862 In her 64th yr.
SUMMER KNAPP Died July 11, 1831 AE 30 yrs. William J. Son of Orrin & Susannah KNAPP Died July 11, 1832 In his 7 yr.
Willard D. Died __4 AE 2 yrs. Achsah W. Wife of Lyman W. KNIGHT Died Apr. 15, 1855 AE 34 Yrs. & 7 Mos. Little flower pray for us. Peter LAMPMAN Died Aug. 31, 1899 AE 77 Y'rs. Co. G. 98 Reg. N.Y. Vol. Gilman LIVINGSTON died Dec. 12, 1884 AE 74 y'rs. Henry Died Aug. 3, 1900 AE 47 yrs. Sarah Died Aug. 13, 1862 AE 4 yrs. Alva MERRICK Died Mar. 1, 1881 AED 1 Yr. 3 Mos. 8 Dys. George W. MERRITT 1840 - no date Co. D. 5th Reg. NY Inf. Vol. Lucetta M. MOORE Wife of Frank CAMPBELL Died June (Jan.) 19, 1877 AE 20 yrs. Harvey MOORE Died May 28, 1871 AE 66 yrs. Cora L. Wife of P. D. MOORE Died May 1, 1877 AE 18 yrs. NOTE: Rita Orton submitted the following, which she found in the Malone Palladium, August 12, 1869: "In West Bangor July 31st., Mrs. Sabra Moore, wife of Harvey Moore, aged 64 years had died." This may be the missing person, inscribed on the side lying on the ground. ?? Dau. of John & [Theresa] O'CONNELL Died Sept. 4, 1860 AE 1 year 8 mos. We miss thee at home. Addie O'CONNELL Dau. of J. & A. O'CONNELL Died Sept. 4, 1860 AE 1 yr.. 11 mos. James Son of J. & M. O'CONNELL Died Jan. 15, 1863 AE 5 mo. 15 ds. Suffer little children to come unto me. Zina (Anna) WITHERELL Died Nov. 5, 1881 AE 84 Y'rs. Dorcas WITHERELL Died Dec. 12, 1886 AE 84 Y'rs. Minnie F. Dau. of Francis & Julia A. O'CONNELL Died Feb. 21, 1890 AE 22 yrs. Patrick O'CONNELL Died Dec. 4, 1882 AE 75 yrs. George Son of Patrick & Marget (sic - not an error) O'CONNELL Died Mr. 29, 1842 AE 2 yr. 4 mo. To live with God in endless day. Lydia Ellen OWEN Died June 1, 1850 Aged 15 yrs. 21 dys. Capt. Thomas PERSON Died Apr. 9, 1875 AE 79 Y'rs. Louis OSGOOD Wife of Capt. Tho's. PERSON Died May 30, 1877 AE 79 Y'rs. Lucy A. Wife of Liberty PRENTICE Died June 4, 1867 AE 45 ys. For me, my Saviour called me home. Ellen Wife of Liberty PRENTICE Died Apr. 24, 1871 AE 34 Y's. Nelson E. Son of Liberty & Lucy PRENTICE Died Nov. 11, 1868 In his 19th yr.
Fanny L. Died Oct. 20, 1848 AE 15 mos. Ethel Wife of Jerry RUSHLOW died Jan. 18, 1885 AE 19 yrs. Alex. SARGEANT Died Mar. 30, 1861 AE 74 Yrs. Many a joy has gone with thee. Roxana Daughter of A. & C. SARGEANT Died June 3, 1843 AE 15 yrs. Fanny Daughter of A. & C. SARGEANT Died Feb. 15, 1844 AE 21 yrs. Alexander SARGEANT Died Nov. 22, [1850 or 1880] In the 30 year of his age. Effie M. Dau. of Orin (sic) & Anna SMITH Died Jan. 5, 1876 AE 7 y'rs. 3 mo. 12 ds. Suffer little children and forbid them not to come unto me, for of such is the kingdom of heaven. Abigail Wife of Andrew STEVENS Died Mar. 15, 1864 AE 70 Y'rs. & 2 Ms. In memory of Sophronia Consort of Henry STEVENS Died Sept. 10, 1828 In the 25 year of her age. Clarence L. Son of Frank M. & Nellie STEVENS Died Sep. 5, 1890 AE 4 M'os. Pearl R. Their Dau. Died Oct. 26, 1901 AE 4 y'rs. Nellie M. Wife of Frank STEVENS Died Sept. 10, 1901 AE 33 Y'rs. Amherst T. STEWART Co. M. 18 N.Y. Cav. Died Mar. 29, 1902 AE 77 yrs. Anna G. AUSTIN His Wife Died Dec. 7, 1903 AE 80 Y'rs. Loanza Wife of Capt. Henry Y. TARBELL Died July 12, 1843 Aged 26 yrs. Henry Y. TARBELL died Feb. 14, 1898 AE 84 yrs. Zilpha P. His Wife Sep. 6, 1892 AE 73 yrs. Loanza A. dau. of H. Y. & Zilpha TARBELL died June 4, 1873 AE 28 yrs. Walter W. TARBELL died June 1, 1885 AE 32 yrs. Sallly Wife of Wm. TARBELL Died Jan. 1, 1859 AE 71 yrs. & 9 mos. Abarintha Daughter of Wm. & S. TARBELL Died Apr. 10, 1835 AE 13 yrs. & 3 mos. Daniel Son of Wm. & Sally TARBELL Died Apr. 23, 1836 (1835) AE 2 yrs. & 8 ds. Esther A. Daughter of Wm. & S. TARBELL Died May 12, 1843 AE 17 yrs. 8 mos. & 4 ds. Death loves a shining map. Experience Wife of Daniel TAYLOR Senr. Died Dec. 9, 1862 AE 86 yrs. Wilder D. Son of Daniel & Lovisa TAYLOR Died Jan. 5, 1865 AE 31 y'rs. Adaline E. Daughter of D. & S. J. TAYLOR Died May 11, 1851 AE 1 yr. 6 mos. Harry Son of M. & B. THOMAS Died Jan. 9, 1905 A E 4 mos. 6 ds. Louisa Wife of Grant THOMAS Died Sep. 15, 1907 AE 40 Yrs. Orpha Dau. of W. C. & Ida THOMAS Died Nov. 23 , 1908 AE 7 Y'rs. 11 Mo. 20 Ds. Alvin TRIM Died June 24, 1905 AE 79 yrs. Lyman WEEKS Died Aug. 25, 1822 AE 88 Y'rs. Hezekiah W. Died June 10, 1842 AE 9 yrs. Hannah T. Died Feb. 27, 1842 AE 7 yrs. Harry C. Died Feb. 27, 1842 AE 11 mo. That they with Jesus live. Jonan. WELLS Died at NY City Hospital May 18, 1862 AE 26 Yrs. Corporal of Co. G. 98 Reg. N.Y.S.V. Esther Dau. of John & Anna WELLS Died Jan. 14, 1889 AE 1 yr. 9 mos. 24 days Asleep in Jesus. Isabell Daughter of Zina & Dorcas WETHERELL Died July 12, 1844 AE 4 yrs. 10 mo.